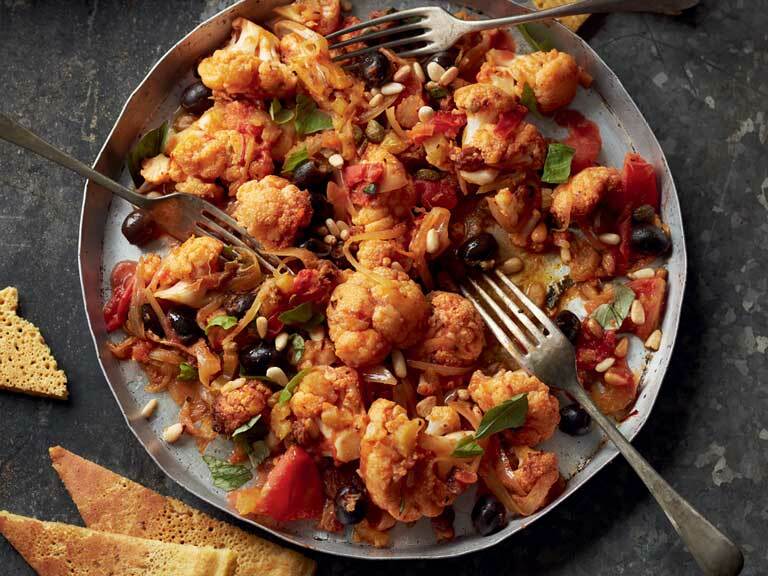 Nutty, tangy Sicilian cauliflower with capers, olives and sultanas, served with farinata, a traditional Italian pancake made from chickpea flour. This dish is best served warm or at room temperature. The tomatoes are warmed gently – you don’t want them to cook down into a sauce. Instead, let the mixture rest to allow all the favours to mingle and mature. If you have the chance or are planning ahead, let it sit for two or three hours and gently reheat it before serving. The farinata batter is all the better for a long rest, too. Farinata is a chickpea flour pancake that is perfect alongside rich veg dishes. It adds a bit of protein and mops up all the flavoursome sauce at the end. The batter looks worryingly thin, but don’t panic, it will thicken and set under the grill. Preheat the oven to 200˚C (Gas Mark 6). First, make the farinata batter. Put the flour into a mixing bowl. Slowly whisk the measured water into the flour until you have a smooth, thin batter. Whisk in the salt and olive oil. Leave to rest for at least 30 minutes. Meanwhile, place the cauliflower florets in a roasting tray. Oil them well, then season with salt and pepper. Roast for 12–15 minutes, until nicely coloured and tender. Warm some olive oil in a wide saucepan. Add the shallots and celery and fry gently over medium-low heat for 10 minutes, until starting to soften. Mix in the tomato purée, sugar, garlic, vinegar and saffron and water. Cook for another 2–3 minutes, until the sugar has dissolved. Now tip in the cauliflower, tomatoes, olives, sultanas and capers. Mix together, then warm gently for 3 minutes. Remove from the heat and adjust the seasoning to taste. Leave to rest while you make the farinata. Heat your grill on a medium-high setting. Heat a layer of olive oil in a large heatproof non-stick frying pan over medium heat. Tip in the rested farinata batter and cook it for 4–5 minutes, until the underside begins to set. Slide the frying pan under the grill and cook for a further 3–4 minutes, until fully set, coloured and crisp on top. Leave to rest for a few minutes, then turn out onto a board. Add the pine nuts to the cauliflower, tear in the basil and mix together. Slice or tear the farinata into generous pieces and serve alongside the warm cauliflower. Dirty Vegan by Matt Pritchard is published by Mitchell Beazley, £20. Photography by Jamie Orlando Smith and Chris Terry. Dirty Vegan is on BBC One Wales and available on BBC iPlayer in January 2019.